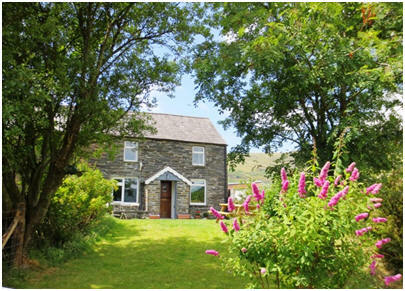 Our cottage is at the head of the beautiful Penmachno Valley in the Snowdonia National Park. Surrounded by hills, seven waterfalls may be seen from the front garden and parking space to the rear of the cottage. Walks from the house are described as some of the best in Wales and it has unrivalled views from all windows. Ideally situated for exploring Snowdonia’s fascinating peaks, the fabulous North Wales coastline and the hidden wooded valleys, Glyn’s view is a perfect home from which to plan your day. Driving in the mountain landscape towards the sea is a rare pleasure. National Trust land is all around and provides a haven for wildlife. The garden is ideal for both dogs and children and the silence is so restorative. Blaen Cwm means ‘head of the [amphitheatre] valley’ and Glyn’s View Cottage has panoramic views of woodland, meadow and mountain scenery from the house and garden. Approached by a short single track lane and standing some way from the centre of Cwm Penmachno, it provides a peaceful retreat from our hectic pace of life. Glyn’s View cottage Sleeps 2 to 4 + 1 people in a king size bedroom, a small double (small space either side of the full sized bed) and a downstairs day bed in the dining extension. 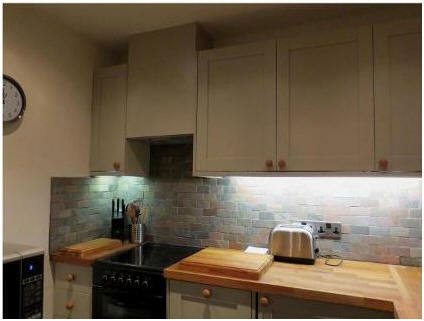 It has a downstairs shower room, with a large shower enclosure and super air boost electric shower, an en-suite bathroom (to the main bedroom) and a fully fitted, well equipped kitchen with oak worktops. Painted throughout in Farrow and Ball Strong White and Parma Gray, the cottage has a light and airy feel although all of the original features present before renovations have been retained. The sitting room has a 32” TV, (with free sat for good reception), DVD/CD player and an iPod dock, There is a telephone (honesty box) and internet access (which may be intermittent due to the remote location. The stairs are quite steep but there is a ground floor shower room and a day bed in the dining room extension. The kitchen has everything you need including a washer/dryer, dishwasher and fridge/freezer. 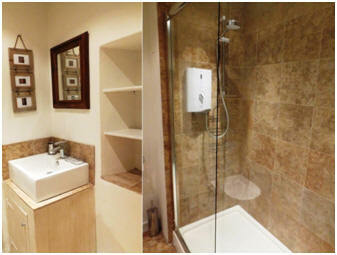 Our cottage is ideal for two people and has a romantic ambience. 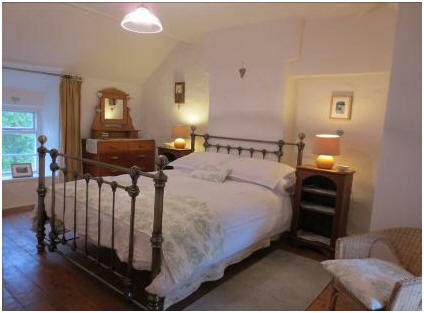 Its lovely location would be perfect for a honeymoon or wedding anniversary where your dogs are welcome too. Of course, we are also entirely family friendly! Children must be 8 or over because of the stairs. The cottage is heated by fully programmable new generation electric radiators (they will take into account the heat from the ones run by the fire if it is being used) and is cosy throughout the year. 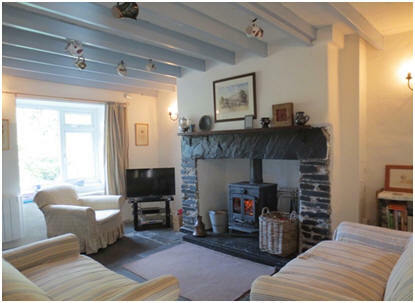 In fact, a romantic winter holiday in Glyn’s View cottage is amazing.